Convallaria, commonly know as Lily of the Valley is a herbaceous, perennial native to the cooler regions of Asia and Europe. Traditionally made into posies in France for May Day due to its deliciously fragrant and attractive appearance, lily of the valley can also be a sumptuous addition to any border, patio or cottage garden. Usually thought of as a difficult plant to grow lily of the valley is slowly creeping its way back into our gardens as retailers are now selling bare root plants and ready potted crowns. It is cheaper to start from pips although these can be slower to establish, buy the pips and pot them up separately in compost, water well and allow them to establish fully before planting out. This process can also be done midwinter in order to force the crowns into an early show. When planting outdoors work in some leaf mould or high quality garden compost before planting. Choose an area that is in full or partial shade with moist and well drained soil that is adequate for the variety you have chosen, as with any plant if in doubt always follow the instructions that are attached. Once your plants are thriving it all becomes a lot easier as they do not require any pruning and are generally pest free. Any difficulties faced are worthwhile overcoming as once your plants are established they will provide your garden with an amazing aroma and a beautiful display of bell shaped flowers for years to come. Over time your plants will form a thick carpet and are easily propagated by division with a sharp spade in the Autumn. 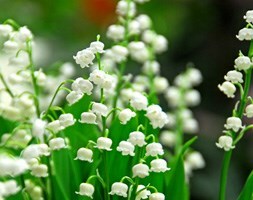 Lily of the valley shares a common name but should not be confused with pieris, lily of the valley shrub. Convallaria has been awarded the prestigious award of garden merit by the RHS. The Royal Horticultural Society's Award of Garden Merit (AGM) helps gardeners make informed choices about plants. 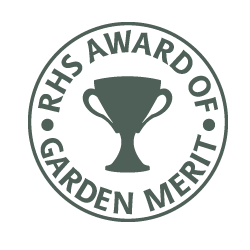 This award indicates that the plant is recommended by the RHS; awards are usually given after a period of trial. Convallaria 'Lily of the valley' available online.. Strongly scented bell-shaped flowers with waxy textured petals are followed by bright red berries. These appear on slender upright to gently arching stems, which arise from amongst the lush green foliage. As equally stunning as its more common cousin this fabulous variety produces many more larger flower heads held above dark green foliage in early spring. 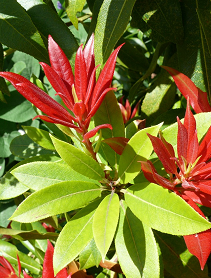 Use them in your lawn for a natural look, delightful under trees and shrubs where they make a timely appearance year after year to announce the arrival of spring. I saw an incredible sight last spring – lily of the valley growing wild and filling the air with their extraordinary perfume and it has spurred me on to plant more. These delicate, scented native wild flowers will thrive in dry or damp shade. They'll live there happily forever and of course, no May garden (or bedside) is quite complete without them. The Lily of the Valley (Convallaria Majalis) is one of the most beautiful and well known plants for naturalising under trees and shrubs, where they eventually form a dense carpet of fresh green leaves and small white flowers. The dainty bell-shaped flowers fill the garden with a glorious fragrance in May. These flowers are also used in the perfume industry. Also ideal for pots on the patio. More Convallaria and other Convallaria cultivars..